Full undergrounding of the power lines entails burying the lines along the street as well as the laterals to each service address. The Board is recommending partial undergrounding where the primary lines are buried but the laterals will remain above ground. 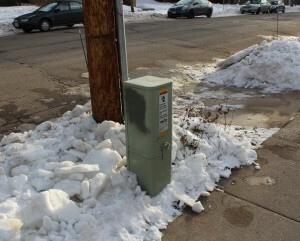 There is a version of this already at work at both 936 and 928 Jenifer Street where the laterals are buried to the homes and a green junction box sits on the terrace. In the late 1970s or early 80s Richard Guyot, while in the midst of a large remodeling of his home at 936 Jenifer had his power lateral buried since the home was receiving a partial new foundation. “I had the lines put underground because of my father. He says that way you don’t have to climb a pole when there is a problem.” Guyot said. His father was an emergency lineman for Detroit Edison and climbed many a pole in the most foul of weather. Richard contends that burying lines is always more expensive but less susceptible to weather-induced outages. Guyot, who also buried the lateral at 928 when he and his wife Judith owned the house as an income property, also says having the lines undergound just has a cleaner look. The power pedestal outside 936 Jenifer. Power comes down the pole in the silver pipe and then underground to the property. 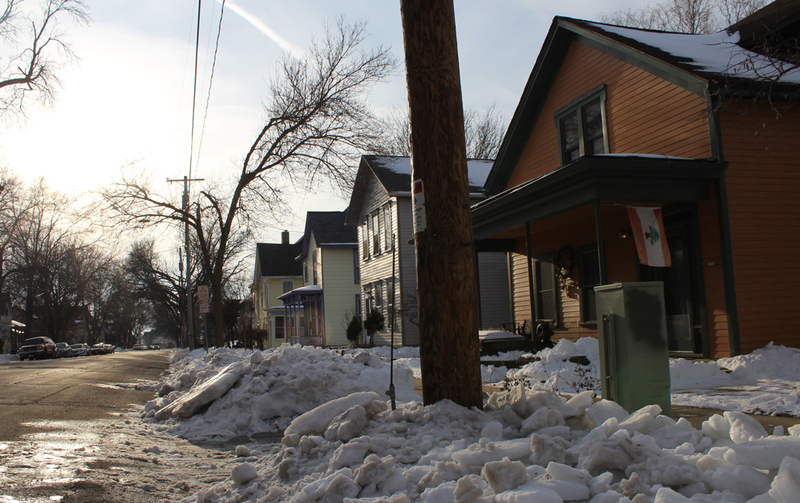 The City has a policy for undergrounding wires and while it is possible it would take a combination of City and private money to include it in a project like Jenifer Street. City of Madison Principal Traffic Engineer Christina Bachmann says that currently the City has not budgeted money in the Jenifer Street project for undergrounding wires. “There is still a possibility of undergrounding but the adjacent property owners would have to pick the tab up for that,” Bachmann told Willy Street Blog. “MG&E (Madison Gas & Electric) would be willing to work with all of us and coordinate that effort but kind of the sticking point is who will pay for this…but if the neighbors would collectively like to get together and try to get a block or a half a block undergrounded it could be possible,” Bachmann continued. The benefits to undergrounding are many according to the MNA Street Trees Committee. Retaining the canopy will reduce energy costs in the summer through shading, tree roots help prevent excess storm runoff, habitat for animals that make the trees their homes or commutes, increased privacy for homes and traffic calming. The City of Madison uses the Right Tree, Right Place criteria when determining what trees to plant or remove in those locations which are usually under power lines. MNA Board Memember Anne Walker says that the type of tree now allowed in that area are much smaller. Madison Gas & Electric also publishes a guide for those who want to plant near power lines but does not control what is planted. 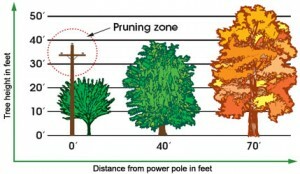 MG&E’s Steve Schultz says that trees maybe subject to trimming if they encroach upon power lines. The City has said in the past that Jenifer Street does not qualify for the underground utility program and there are no funds available. The committee is calling for partial undergrounding but there seems to be a discrepancy in the cost. In a fact sheet published by the committee no cost was given of what partial undergrounding would cost each homeowner but they the document did state that full undergrounding would cost $2,500 to $3,500 per property. WSB is working to clarify the details of the fact sheet with MNA. Christina Bachmann says that her initial analysis of the of the per property cost is around $4,000 for partial undergrounding. The City’s undegrounding policy does not get as detailed about the per home cost but does state that full undergrounding could cost $30,000 to $100,000 per 100 feet. “The MNA Board supports the initiative to underground the primary (i.e. high voltage) powerlines in the Jenifer Street reconstruction area with the goal of maintaining the existing canopy trees and allowing for the future planting of canopy trees”. This entry was posted in Uncategorized, Willy Street, Willy Street Commentary and tagged Anne Walker, Christina Bachmann, City of Madison, Few Street, Hyer-Jaquish Hotel, Ingersoll Street, Jenifer Street, Leslie Schroeder, Livingston Street, Madison Metro, Marquette Neighborhood Association, MNA Street Trees Committee, National Regiser of Historic, Orton park, Paterson Street, SASYNA, Spaight Street, Traffic Engineering, Williamson street by TheEastSider. Bookmark the permalink.